The educational and promotional materials on this page will continue to expand so check back regularly. Larger files for high-quality printing are available. Direct all questions and requests to CTA Communications Officer, Megan Grunewald. 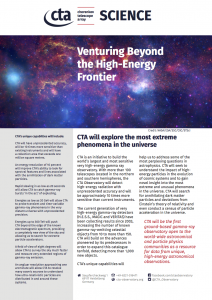 The CTA brochure will introduce you to how CTA will work, our major science goals and the technology and organizations around the globe behind the project to build CTA. 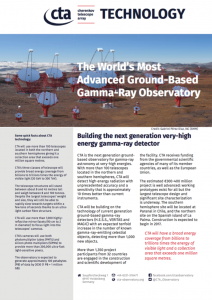 Click here to open the English version (June 2017) of the CTA Brochure in a PDF viewer. New!!! 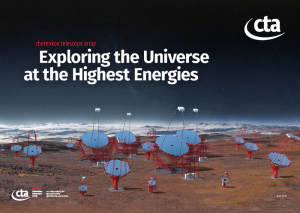 Click here to open the Spanish version (October 2018) in a PDF viewer. 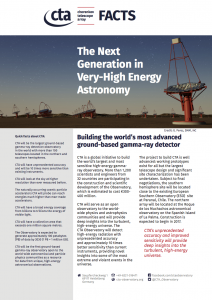 Click here for the Japanese version (October 2018) of the brochure. 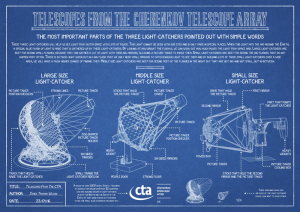 James Wilson, a final-year undergraduate student at Durham University created these printouts and poster to help explain CTA telescopes in the simplest terms. The images were inspired by ‘The Thing Explainer’ by Randall Monroe. 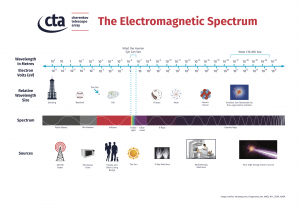 This infographic illustrates where CTA’s energy range falls on the electromagnetic spectrum.